AHRE is a 501(3)c nonprofit run 100% by volunteers. Volunteers are needed to help care for the horses, aid in the fundraising activities, work with the horses to prepare them for adoption, clean stalls and much more! Our volunteers are our greatest asset because they get things done! If you would like to volunteer with AHRE please complete the application below. If a volunteer is under 18 years of age, a parent or guardian must also complete a volunteer application and agreement form. Volunteers in this category must be accompanied by an adult. 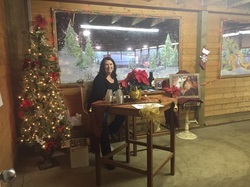 All orientations are held in The Warming Room at Calcagno Equestrian Center. There are currently many jobs we need help with on Saturday and Sunday. They include stall cleaning and feeding. ​Please click here to sign up for these spots online. We have created a training path that will get you started right away. It gradually steps up in difficulty to bring you closer to the horses and improve your handling skills. At each step of the path you will have our volunteer coordinator helping you. The volunteer commitment is 3 months; either 4 days or 10 hours each month at the stable must be completed by all Beginner Barn Buddies in order to move up to Intermediate Barn Volunteer. Maybe you can't lift 50 lbs but you would still like to help. We also offer light duty activities like grain portioning and tack cleaning. Do you have special skills? Volunteers can support in multiple areas. If you have any questions or need guidance or a volunteer training, please contact our volunteer team leaders. We also have a facebook group for our team of amazing volunteers! Its a great way to stay informed together. All of our regular barn positions are scheduled online through SignUp.com. Click on the links to schedule your shift today.